With its large work area, this multi-purpose, heavy-duty table accommodates a broad range of needs — from small group art class projects to ceramic studios, workshops, and labs. The edged top measures 60" × 42" × 1¼" thick. Its durable laminate surface resists stains and scratches. 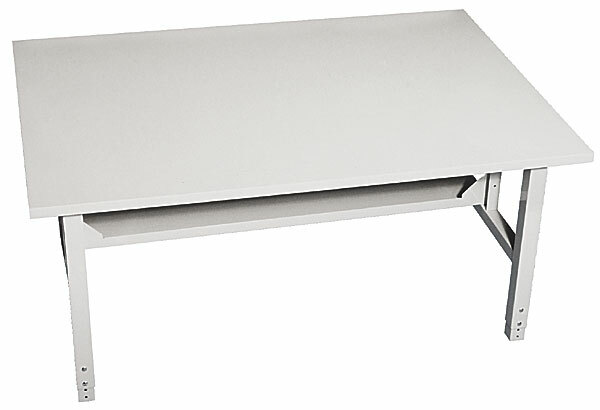 The easy-to-assemble, sturdy steel base has adjustable legs, allowing the height of the table top to range from 26½" to 30½". Features a durable powder coat finish. Floor glides protect classroom and workspace floors from scuffs and scratches. Putty color. Table with Rounded Edge — The rounded edges of this table's top offer superior safety.